What aspect of your ministry through music and worship leadership gives you the greatest sense of Kingdom accomplishment? o My greatest sense of accomplishment for the kingdom is when one of the children that has been in my children’s choir or has been one of my Sunday School students, comes to know the Lord Jesus as their personal Savior. There is no greater joy than to think that in some way I contributed to their understanding of their need for a Savior. o My greatest sense of accomplishment for the Kingdom comes when my choir “gets it”. I really try to instill in the choir that they, too, are worship leaders, not just me. When the choir worships during a special or during the congregational music, I know that God is pleased and that He is speaking through them. Time and time again I have told the choir “We will work to get the music as close to perfect as we humanly can. However, I am willing to sacrifice some rhythm and notes here and there as long as we are getting the Spirit of the song right and are worshiping when we sing.” That, to me, is the best way to lead our congregation in worship and into worship.for us to worship and not be preoccupied with the mechanics of the song. o When I see a student begin to show signs of understanding what a song means, or why we sing it in worship I feel I have accomplished something for the Kingdom. Although it is true for any age group I find it especially meaningful when one of our youth catches on to what music in worship is all about! o I have taken several mission trips with different age groups. Music has a way of breaking down barriers in other countries and when that happens I feel like we have done something that will have eternal value. o Sharing my faith in music with passion. 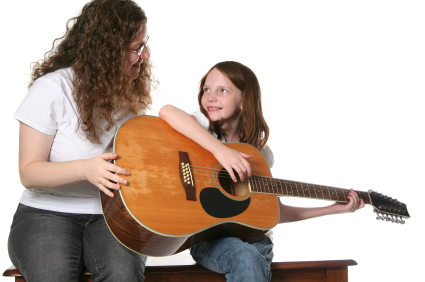 o When a child, youth, or adult passes a milestone in their life musically or spiritually and I have had part in helping them (like learning to sing on pitch or beginning to play guitar), I have a sense of accomplishment that will last. o Watching young people grow to become leaders. Not just in music but in all phases of the church. I have found that among all the aspects of music and worship ministry that I am involved in, I get the greatest sense of accomplishment in seeing people that I have worked with become leaders themselves. One might think that the thrill of leading worship, seeing a massive pageant come together, directing a full choir or building a program would be the facets of ministry that would rise to the top of the list. These are all wonderful when they happen, however, I feel the greatest sense of satisfaction in the results that I see with a handful of people. In ministry it is not possible to invest in the lives of your entire church congregation. It is possible, however, to focus in on a few key people. They, in turn, are able to invest in the lives of others as well as using their gifts and talents for the benefit of worship and praise to our almighty God. It is amazing to see kingdom work carried out when the body is “fitly framed together, growing unto an holy temple in the Lord”. (Eph. 2:21) It is, indeed, a thrill to lead in worship, but it is an even greater thrill to see those that I have invested in leading others in worship. As always, we must be careful to have the attitude of the psalmist when he said, “not unto us, O Lord, not unto us, but to Thy name be the glory”. I find these responses to be an encouragement and very positive word that I want to pass on to pastors and other church leaders. I am afraid that too often many look at music ministry as something that entertains rather than understanding its profound effect in Kingdom work. The old “there’s no business like show business” jowokes do not really apply when you hear the heart of the vast majority of our worship music leaders. I say that with great confidence as one who fellowships often with so many of our ministers through music. The words in these few representative responses above should demonstrate the real heartbeat of those serving in music ministry leadership – and these responses are not just from professional ministers of music. They include replies from children’s choir leaders and others. There is a level of maturity reflected in these representative replies that I am convinced we desperately need in our churches. A Kingdom perspective that is critical to the churches’ ministry, and often undeveloped in less mature ministers. This is part of the reason I often appeal to churches not to throw away good leaders, ministry practices, or methodologies just because they are “old.” Biblical truth, trusting in the Holy Spirit to work, and worship itself are all quite old realities. Granted we must always be fully aware of our context and make appropriate adaptations accordingly, but we need a balanced response that is careful to keep a right focus on God as the subject and object of our ministry with the people we serve and those to whom we will proclaim Christ as Lord! Having just returned from a week with teenagers at the Georgia Baptist Youth Music Camp I have been freshly reminded of dependence upon the Holy Spirit to do His work. I went to the camp with a game plan for teaching the music, reflecting on the meaning of text and underscoring biblical foundations of the songs, while at once developing a sound and moving toward a Saturday “end of week concert” before parents and friends. The balance of voices was less than perfect. The group was younger than expected. The music was a bigger challenge than anticipated. A group of adults, fellow music ministers, stepped up to help and worked to bring about a positive result. The students responded to the challenge and worked extra hard to conquer the music. On Friday night in a time of opportunity for open response, students stood to testify of lives changed, commitments made, lessons learned. Themes of the week turned out to be humility in lives of worship and strengthening of Christlike character, and understanding our place in the stream of endless praise of our God in Christ. The Spirit spoke to me deeply about all of those through these students and their leaders. All of which affirms what the statements by many of you in response to this week’s question mean. God is still at work in us, through us, and among us. Lord, help us to remain sensitive to You in all we do. 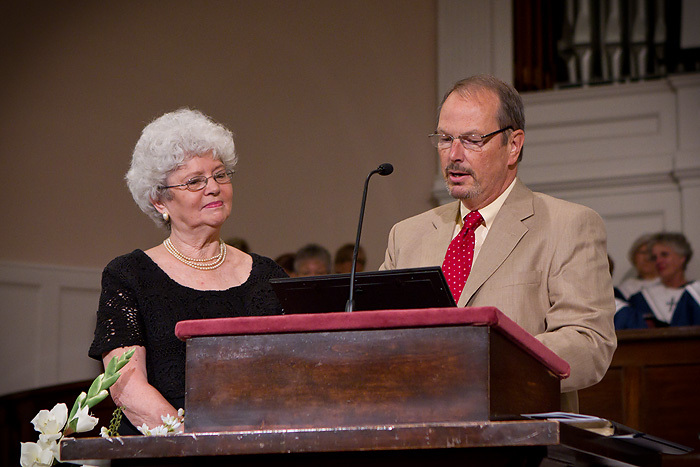 Sunday night I attended a service of celebration for Mrs. Peggy Williams at First Baptist Church Paris. 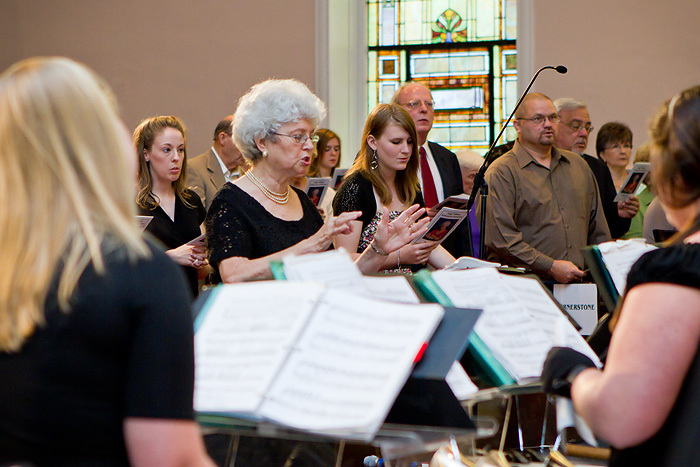 Peggy is retiring from her position as church pianist and as handbell director for the church. I could write extensively about Peggy’s accomplishments through her groups of ringers, singers, her work in serving her community through music, etc., etc. All of that is now a matter of record. What I want to do instead is reflect on the ministry itself and the profound evidence of its effect for the Kingdom. I know that I lost some readers when they saw “church pianist” (out of date terminology) and/or “handbells” as many see bells as a reflection of days gone by. As one musician told me some time ago, “those things reflect the traditional church that died a long time ago.” (the gospel according to his own senstibilities). I admit I was surprised to see a full sanctuary Sunday night in Paris. I was proud of a senior pastor who demonstrated love and appreciation for Peggy by encouraging such a service and participating in it himself whole heartedly. I know that pastor and full house of people were there more to affirm Peggy and her contributions than just to hear a lot of handbell music. The service presented an opportunity to say “thank you” and they were there in force to do so. For those still reading…here’s the point of worship for me in what took place Sunday night. The ringers who participated in the “reunion choir” were persons who had been in one of Peggy’s youth handbell choirs over those 39 years of faithful service. They were there to express love and appreciation for what Peggy had meant in their lives, but the visual effect of those young men and women parading back and forth to the bell tables packed a dramatic punch. Their very presence painted a powerful picture of a life well lived in service through music as ministry. During hours of rehearsals and bus rides on annual tours the life of one determined lady had ministered Christlike love and patience and concern into the lives of these folks who are now young adults making major contributions to their communities, their churches, and ministries of all sorts in many places. As all of you know, music does not just happen. If a group is formed to present music whether sung or played, then there must be times of honing the craft, working the parts, shaping the phrases….just hard work. Along the way, certainly, discovery of meaning occurs and touches the soul of those making the music, who pray that the touch will be passed along to those who will listen. Music ministry leaders, there are many among us who are hurting from pressure to change direction of music or program to something for which they do not feel qualified. We need to pray for them and for one another. There are several who have recently been asked for their resignation, or prodded to begin searching for other places of service. We need to pray for the Lord’s will to be accomplished in their lives and that of their churches. We need to hold one another up to be accountable in our ministries, and to find strength from the fellowship of fellow ministry leaders as well as among those in their own fellowship. We need to pray that our pastors and church leaders would grow in wisdom before chasing patterns the Lord may be using in other places, and would discover what unique calling God has placed within the church body they serve. Ministers, to help you all make it through times of transition and/or times of grand celebration – through feast or famine – consider who your parade of singers and players might include. Last week I offered a question to spur response regarding the participation level of your congregation during gathered worship. I appreciate those who took time to respond, both worship music leaders and others including a few who serve as pianists, organists, or who lead a children’s choir or ensemble. I am posting some responses that are representative of those received along with a few observations I would like to offer. (Also, see the next question for response at the end of this article) As promised these will be posted in a manner that will protect the writers’ anonymity. 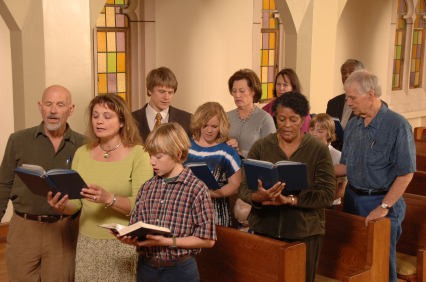 If you could be perfectly honest and transparent about your estimation of what happens in regular Sunday worship at your church, what would you tell your congregation about their level of enthusiastic participation in Sunday worship? People, why are you not participating? We have worked hard to prepare songs that I thought you would appreciate and be able to sing. You are half in and half out. Worship is not a halfway thing. I cannot guess what will help you really worship. Some of you say you want one kind of music, and others want another. I am trying to find what will help you genuinely express worship. Obviously I am not there yet, or maybe you just are there yet? This is corporate worship, not mass simultaneous individual worship time. Your attitude and activity strongly affect those around you and you can choose whether that influence is positive or negative. Arm-crossed passivity can have a negative impact on those around you. If you are not a particularly demonstrative person in worship, fine, but looking like you are miserable and/or pained by being there is very distracting at best. Please consider your role in public worship, you are not invisible, but an important part of the whole as we gather for worship. As I observe each of you during our Sunday morning worship service each week, I notice a great number of you putting forth effort to participate in active worship through singing and hearing the truths of God’s Word proclaimed and through prayer, reflection, and giving. However, this effort often seems to be lacking in genuine, humbled response to our Creator and Redeemer. As we gather collectively each week for the purpose of corporate worship, I hope that it is less a once a week experience for you and more of a continuation of a Monday through Saturday already spent with the Lord, and that there is a sense of familiarity and expectation of coming to meet our Lord in reverent submission and worship. I am concerned that the level of enthusiastic participation and your lack of desire for worshiping Almighty God may be directly tied either with the lack of a relationship with God or with the lack of regular time with God. Our time of corporate worship is the most important facet of this church body, and I pray we will seek to make more so in the coming weeks. I appreciate your efforts to join in rhythmic response by clapping and dancing around, but I cannot tell if you are seeking God or if you are just caught up in the music itself. HELLO! HELLO! Are you out there? Dear church family,I love all of you and desire so much to help you express praise and worship. I wish you could just tell me what would help you most to express your worship! The prelude is not a challenge for you to talk louder. I am trying to help you prepare for worship. Thank you for letting me lead you in worship. I want so much to lead you to the throne where you can be awed in his presence. In my estimation the responses received are reflections of worship leaders who have a proverbial finger on the pulse. You who lead worship genuinely care about the response of the people and ultimately about their worship connection with God and one another. I would posit that it is very important to remember that God looks upon the heart. One of the reasons worship evaluation is so tough is that we cannot see the heart. What we see and hear is certainly not the full story of what is taking place in the hearts of the people we serve. I am sure we have all had times when people’s personal responsiveness were more indicative of participation than their outward visible and vocal indications. Finally, let me remind you that part of my ministry is helping you serve in yours. I hope you feel the freedom to contact me when I can be of assistance, and that you will spend time with other worship leaders in your area and in the state. It is good to share resources, compare situations and trade ideas to build one another up in the work of the Kingdom. Needing each other is a good thing. Part of sharing faith is participating in community. What is one thing you wish your church provided for your ministry that they do not currently provide? One of the great principals of biblical faith is Sabbath. We all know the commandment, “Remember the Sabbath Day, to keep it holy.” (Ex 20:8) Knowing what the commandment says and practicing it within our regular life pattern are two different things. When I mention taking Sabbath to most worship pastors I receive a sighing response, usually accompanied by something like, “I try.” I can relate to the reality that it is just tough to find time to push back, reflect on the holy, and rest. Tough but absolutely necessary. Sabbath and worship are intrinsically tied together. I strongly encourage worship pastors to research that connection and to practice what we need to be preaching. The end of Spring presents a shift in programming and routine for many if not most of our churches. Schools are out, Summer vacations begin, VBS is upon us, etc., etc. As you look at the Summer months I do hope you have plans to do some refueling! I realize the cost of gas is high, but you can find spiritual retreat on your back patio if you will purpose and covenant to quiet the noise and position yourself for the Lord to speak. 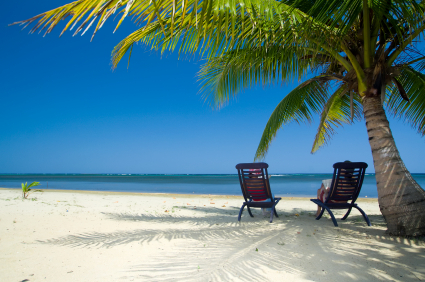 Of course, if you can make it to the beach or a mountain hideaway, go for it. I reserved this past weekend from responsibilities other than family. I knew it was a holiday weekend and we were to attend a very special worship service at First Baptist Church Nashville for the dedication service for my son and wife’s youngest, our youngest grandchild. I did not want to be in my usual rush to get in and out to another church service, or zooming out of town to rush to an appointment elsewhere. We happily agreed to set the day aside to worship together as a family (and we did pack a pew – two pews in fact), and then to spend the afternoon relaxing with family at our son’s home. It was a wonderful relaxing afternoon playing with grandchildren, following all of them to the community pool, visiting, eating.just being. On the way home I commented to my wife that I did not realize how much I just needed a day like this. She indicated she did realize it. Touche` dear. We decided we would extend the spirit to Monday and enjoyed a day at home watching memorial celebrations on television, playing with our oldest grandson in the yard and just being together again. It was wonderful.and rejuvenating. I want to strongly encourage my brothers and sisters who serve in ministry to utilize opportunities this Summer to refuel. YOU CAN HELP ME THIS SUMMER! I want to use my blog and enewsletter to convey some of your thinking and concern. This will depend on YOU to respond. I will end articles with a bait question for the next issue and with your permission will publish your compiled responses. Note: this is not an original idea. I am borrowing from a colleague, and have high hopes you will respond to help your brothers and sisters in similar positions to understand our common situations and encourage mutual prayer support as we minister in the Lord’s church.